So Gabriel Roberts asked me to write something about police brutality, and I told him I needed a few days to get my head in order. The problem being that, with this particular topic, the longer I wait on this, the longer I want to wait on this, until, eventually, the avoidance becomes easier than the approach by several orders of magnitude. Part of this is that I’m trying to think of something new worth saying, because I’ve already talked about these conditions, over at A Future Worth Thinking About. We talked about this in “On The Invisible Architecture of Bias,” “Any Sufficiently Advanced Police State…,” “On the Moral, Legal, and Social Implications of the Rearing and Development of Nascent Machine Intelligences,” and most recently in “On the European Union’s “Electronic Personhood” Proposal.” In these articles, I briefly outlined the history of systemic bias within many human social structures, and the possibility and likelihood of that bias translating into our technological advancements, such as algorithmic learning systems, use of and even access to police body camera footage, and the development of so-called artificial intelligence. Long story short, the endemic nature of implicit bias in society as a whole plus the even more insular Us-Vs-Them mentality within the American prosecutorial legal system plus the fact that American policing was literally borne out of slavery on the work of groups like the KKK, equals a series of interlocking systems in which people who are not whitepassing, not male-perceived, not straight-coded, not “able-bodied” (what we can call white supremacist, ableist, heteronormative, patriarchal hegemony, but we’ll just use the acronym WSAHPH, because it satisfyingly recalls that bro-ish beer advertising campaign from the late 90’s and early 2000’s.) stand a far higher likelihood of dying at the hands of agents of that system. And then we’ll segue to the fact that we are, right now, living through the exemplary problem of the surveillance state. We’ve always been told that cameras everywhere will make us all safer, that they’ll let people know what’s going on and that they’ll help us all. People doubted this, even in Orwell’s day, noting that the more surveilled we are, the less freedom we have, but more recently people have started to hail this from the other side: Maybe videographic oversight won’t help the police help us, but maybe it will help keep us safe from the police. But the sad fact of the matter is that there’s video of Alton Sterling being shot to death while restrained, and video of John Crawford III being shot to death by a police officer while holding a toy gun down at his side in a big box store where it was sold, and there’s video of Alva Braziel being shot to death while turning around with his hands up as he was commanded to do by officers, of Eric Garner being choked to death, of Delrawn Small being shot to death by an off-duty cop who cut him off in traffic. There’s video of so damn many deaths, and nothing has come of most of them. There is video evidence showing that these people were well within their rights, and in lawful compliance with officers’ wishes, and they were all shot to death anyway, in some cases by people who hadn’t even announced themselves as cops, let alone ones under some kind of perceived threat. Police have been accused of cracking down on civilians who film these shootings. Ramsey Orta, who filmed an NYPD cop putting unarmed black father Eric Garner in a chokehold and killing him, says he has been constantly harassed by police, and now faces four years in prison on drugs and weapons charges. 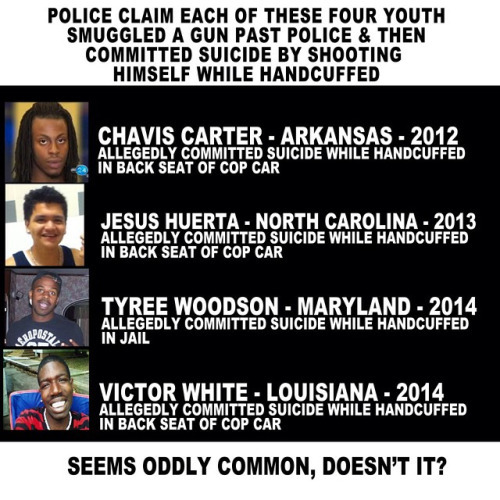 Orta is the only one connected to the Garner killing who has gone to jail. Chris LeDay, the Georgia man who first posted a video of the police shooting of Alton Sterling, also says he was detained by police the next day on false charges that he believes were a form of retaliation. Early media reports on the shooting of Small uncritically repeated the police’s version of the incident, before video exposed it to be false. As we said, above, black bodies are seen as inherently dangerous and inhuman. This perception is trained into officers at an unconscious level, and is continually reinforced throughout our culture. Studies like the Implicit Association Test, this survey of U.Va. medical students, and this one of shooter bias all clearly show that people are more likely to a) associate words relating to evil and inhumanity to; b) think pain receptors working in a fundamentally different fashion within; and c) shoot more readily at bodies that do not fit within WSAHPH. To put that a little more plainly, people have a higher tendency to think of non-WSAHPH bodies as fundamentally inhuman. And yes, as we discussed, in the plurality of those AFWTA links, above, there absolutely is a danger of our passing these biases along not just to our younger human selves, but to our technology. In fact, as I’ve been saying often, now, the danger is higher, there, because we still somehow have a tendency to think of our technology as value-neutral. We think of our code and (less these days) our design as some kind of fundamentally objective process, whereby the world is reduced to lines of logic and math, and that simply is not the case. Codes are languages, and languages describe the world as the speaker experiences it. When we code, we are translating our human experience, with all of its flaws, biases, perceptual glitches, errors, and embellishments, into a technological setting. It is no wonder then that the algorithmic systems we use to determine the likelihood of convict recidivism and thus their bail and sentencing recommendations are seen to exhibit the same kind of racially-biased decision-making as the humans it learned from. How could this possibly be a surprise? We built these systems, and we trained them. They will, in some fundamental way, reflect us. And, at the moment, not much terrifies me more than that. Because if we keep this arms race up among civilian populations—and the police are still civilians which literally means that they are not military, regardless of how good we all are at forgetting that—then it’s only a matter of time before the overlap between weapons systems and autonomous systems comes home. Violence isn’t only dynamic physical harm. Hunger is violence. Poverty is violence. Systemic oppression is violence. All of the invisible, interlocking structures that sustain disproportionate Power-Over at the cost of some person or persons’ dignity are violence. Nonviolence means a recognition of these things and our places within them. Nonviolence means using all of our resources in sustained battle against these systems of violence. Nonviolence means struggle against the symptoms and diseases killing us all, both piecemeal, and all at once. ‘So, the challenge: how to get across the ideas bound up in the word “privilege,” in a way that your average straight white man will get, without freaking out about it?